I was just explaining to my 9 year old how art is subjective. How everything is in the eye of the beholder, and how art’s value to me is dependant wholly on the originality and skill behind said art. Ok. I didn’t say it like that. He drew a Superman logo and was upset because it didn’t look like the one on his pajamas. I said “but that’s the best kind of art, because it’s your own interpretation of the Superman logo.” He wasn’t sold. Then I went onto a Skottie Young diatribe, complete with pictures easily pulled up on the computer, and he finally got it. To say that Skottie Young is one of the most popular cover artists working right now is easy. His lines at cons art around the corner, drawing huge numbers for his original take on characters that we grew up loving. I remember reading X-Men Annual #12, when Mojo turned the X-men into babies in a back-story, and loving the idea. Twenty years later Skottie Young did that exact thing, and it was huge. Now he’s giving us his own book. Why is it important that we read it? Are the deranged musings of a popular artist important? Can they be made into a good, nay great, comic book? Today drops the story known as I Hate Fairyland, Skottie Young’s foray into the world of creator-owned Image comics. It’s a mad romp through a sugar-coated land where mushrooms form the police force, trolls run the gambling, and the queen is a cloud-haired beauty with a deep hatred for little girls with green hair. I’m doing this backwards. The art. Of course the art is the first and foremost thing that you look for when seeing a popular artist-created book. This is Young at his best, with the freedom to do, say, and kill whomever he wishes in the most colorfully gory ways imaginable. His artists’ eye makes a prominent stamp on the book as a whole. Jean-Francois Beaulieu’s colors make the exaggerated line of Young’s art pop on the page. It’s a firework of color, a crazed, pink-infused carnival. The story itself is also an original. Gertrude is a typical little girl, who wishes that she could travel to a magical fairy land filled with all of the things she dreams inhabit such a world. When it comes true, she finds herself face to face with talking animals, the aforementioned queen, and a quest that will take her across the kingdom to a way home. …27 years later, her body has not aged, but her mind has grown, become bitter, and she is still wandering through that world, looking for a way home. Gertrude is no longer the little sweetling we met in the first couple of pages. She is armed to the teeth, and has a little bit of a death wish when it comes to taking up a fight. This first issue pits her against a troll, an army of mushrooms, and the moon itself. 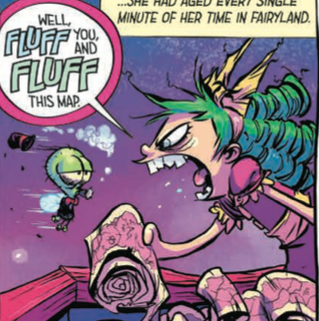 If you’re a fan of Skottie Young’s work, I Hate Fairyland is more of the same. But in this book he also proves that he is a fantastic storyteller with a unique point of view. I Hate Fairyland is a crazy/cute carnage comic, and I loved it. This entry was posted in brad gischia, comic book review, image comics, Jean-Francois Beaulieu, Skottie Young and tagged I Hate Fairyland, image comics, Jean-Francois Beauliwu, Skottie Young. Bookmark the permalink.